Thank you to all the GIGA III participants for making it a stimulating and fun meeting! We would greatly appreciate your feedback on the meeting, the prospect of GIGA becoming a formal society/non-profit organization, and what can be done to make future GIGA meetings even better. The Global Invertebrate Genomics Alliance (GIGA) is a collaborative network of diverse scientists studying invertebrate animal genomics. GIGA aims to promote standards that facilitate comparative approaches and collaborations across the international scientific community. Visit http://GIGA-cos.org for more information about GIGA. The Third Global Invertebrate Genomics Alliance Research Conference and Workshop (GIGA III) will take place in beautiful Curaçao at the Hilton Hotel from 19-21 October, 2018. This meeting will consist of three days of scientific talks, breakout sessions, field trips, and a poster session. Diverse topics will covered, ranging from single-cell genomics to conservation genomics. Attendance is capped at 100. More details and the GIGA III program are forthcoming! Discounted rates on rooms at the Hilton are available for GIGA III participants. Please see the Registration & Accomodations page to book a discounted room. A unique Caribbean island paradise. 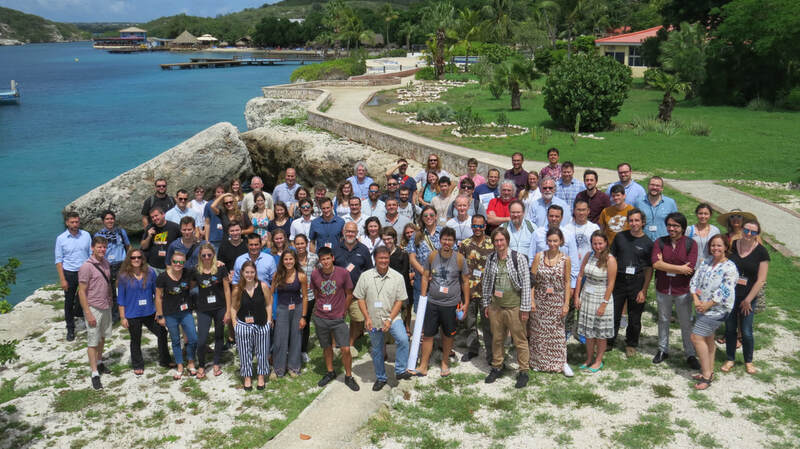 GIGA III will address issues such as conservation genomics and endangered species on a delicate Caribbean island. We encourage participants who fly to Curaçao (as most of us will) to consider paying their carbon offsets and to make as many green choices as possible while planning and during their visit to Curaçao. GIGA II participants during the workshop in Munich, Germany. Last updated 15 October 2018.